For Holistic Personality Development, learning outside the classroom is as important as Inside the classroom. Such events help a student to grow socially, culturally and professionally. Students get to know about their own hidden talent. They help to come over the youth out of their public fear. They help in the promotion of art forms among the youth. To make the future nation builders aware of the diverse culture of the nation and its need to promote it. The students get a chance to take initiative and work out the needful as per their aptitude. Students learn the importance of team work and understand the basics of management. These events make them more familiar with the college environment and with their friends and teachers. These activities are vital for the growth of the student as a personality. An essay writing competition was organized by Faculty of Pharmaceutical Sciences on 15th March, 2017. Theme of competition was 'Role of Pharmacist in Healthcare System'. Mr. Manish Jyotiana, Mr. Sanjay Kumar and Mr. Suresh Kumar secured first, second and third positions respectively. 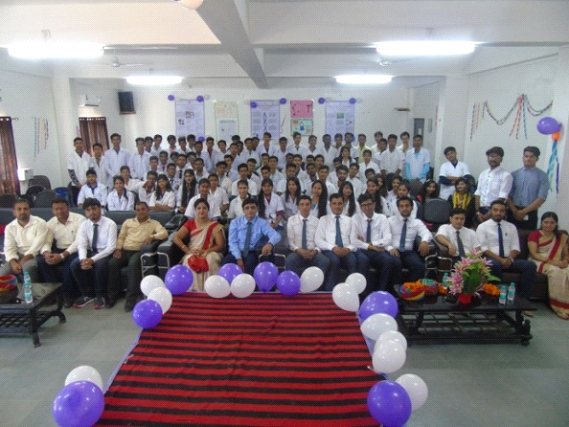 Certificates to these winner students were distributed by Dr. Namita Arora, Principal, Institute of Pharmacy. 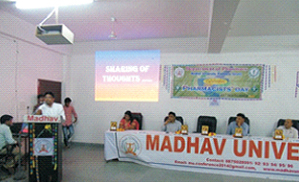 DST sponsored one day Workshop and Training Programme on “Intellectual Property Rights (IPR)” was organized at Faculty of Pharmaceutical Sciences, Madhav University on March 20th, 2017. 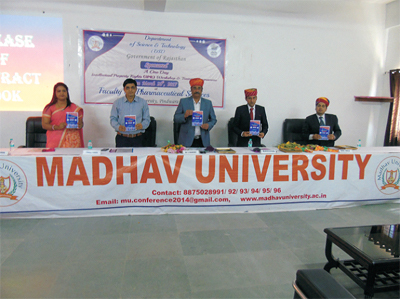 The occasion was graced by the esteemed presence of Professor (Dr.) M. S. Ranawat (Dean, Faculty of Pharmacy, B. N. University, Udaipur) as Chief Guest, Dr. Mahesh Kumar Kataria (Professor & Head, Department of Pharmaceutics, Seth G. L. Bihani College of Pharmacy, Sri Ganganagar) as Speaker, Dr. Rahul Taneja (Scientist, IPR Section, DST, Government of Haryana) as Speaker, Dr. Pankaj Arora (Dean, Faculty of Pharmaceutical Sciences, Madhav University) as Convener, Dr. Namita Arora (Principal, Institute of Pharmacy, Madhav University) as Organizing Secretary, Dr. Naresh Khatri (Principal, Sri USB College of Pharmacy, Abu Road) as Special Guest and Dr. Amit Bhargav (Associate Professor, B.N. Institute of Pharmacy, B.N. University, Udaipur) as Special Guest. 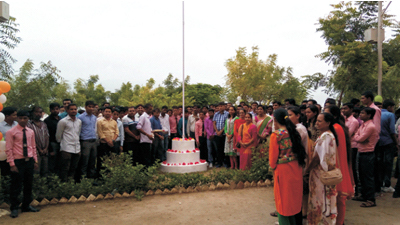 A programme "Azadi 70: Yaad Karo Kurbani(Freedom Fortnight)" was celebrated from 09th August, 2016 to 23rd August, 2016 in the university under the coordination of Dr. Pankak Arora, Dean, Faculty of Pharmaceutical Sciences. The programme was inaugrated on 09th August, 2016. During the programme an Essay writing competition and a Slogan writing competition was organized on 12th August, 2016 and 16th August, 2016, respectively. On 25th September “World Pharmacist Day” was celebrated by Faculty of Pharmaceutical Sciences, which was graced by dignitaries on the dais, Prof. J. L. Vij (President), Dr. Rewat (Pro-President), Mr. J. B. Sharma (Registrar), Dr. Gaurav Khanna (Controller of Examination), Dr. Pankaj Arora (Dean, Faculty of Pharmaceutical Sciences) and Dr. Namita Arora (Principal, Institute of Pharmacy). During the programme Dr. Pankaj Arora told that the theme of this year Pharmacists’ day is “Research to Healthcare System: Pharmacist is at Your Service”. He told that pharmacy students have golden and bright future ahead. Since many decades pharmacists are serving for the society in the field of research, academic, clinical trials, hospital pharmacy and community pharmacy etc. On this occasion Dr. Namita Arora told that Pharmacist is an important member of healthcare team and is playing crucial role in the field of healthcare system. About 250 students and academicians representing various colleges and universities participated in the conference and presented various research and review papers. In this paper presentation competition Mr. Raj Kota and Mr. Jinesh Kumawat of B Pharm Ist year, Madhav University won the Second and third prizes, respectively. Dr. Pankaj Arora, Dean, Department of Pharmaceutical Sciences congratulated both the students and motivated the other students to participate more and more in such conferences.